Ultrananocrystalline diamond/hydrogenated amorphous carbon composite (UNCD/a-C:H) film is a new candidate material applicable to optoelectronic devices owing to its unique electrical and optical properties. This paper describes a recent progress in the research on the application of semiconducting UNCD/a-C:H films to photodetectors. p-Type conduction accompanied by an enhancement in the carrier concentration was realized by boron doping. Spectral response measurement showed obvious photocurrent in the wavelength of shorter than 280 nm and above 500 nm, which probably originate from UNCD grains and mid-gap states owing to grain boundaries, respectively. Photodiodes comprising p-type UNCD/a-C:H films and n-type Si substrates exhibited a clear response for deep-ultraviolet light, and the external quantum efficiency and responsivity were more than 70% and 130 mA/W, respectively. 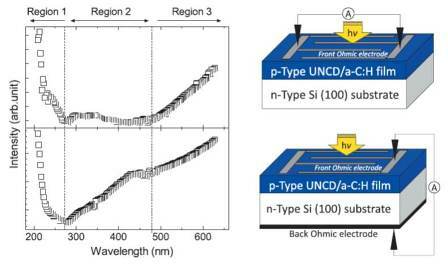 It was experimentally proved that UNCD/a-C:H is a potential material for the application to photodetectors.